There’s so much more to the best trampolines than a sturdy frame with a bouncy surface. Time and again, we find parents walking into an outlet and picking up the first trampoline (or bounce house) recommended by the sales guy. Not that great an idea considering that 100,000 trampoline related injuries are reported each year in America. In fact, we have witnessed multiple instances of a fun exercise session gone wrong because the trampoline wasn’t the ideal one. So, with an upcoming mommies meet in April, we figured that this was a great time to sift through the muck and get you an unbiased list of the best trampolines that money can buy. Believe us on this, we had our tasks cut out. The market seems to be teeming with trampolines in all sizes and shapes. But a lot of those are gimcracks. And it’s not one of those toys that you can be complacent about. You need to be really vigilant before you swipe your card because your kids’ safety depends on it. At the same time, we need trampolines that are easy to set up, use, clean and pack off inside once the skies open up. That’s precisely what we have collected for you. So, sit back, grab a beer and enjoy this read. By the end of this, you’ll be armed with enough information to go bouncing and grab a trampoline for your little ones. The huge boxes that it is shipped in? That’s hardly a deal breaker. Skywalker is one of the best trampoline brands that caters to the budget-minded shopper. Let’s face it. Not everybody can afford trampolines that cost an arm and a leg and boast of schmancy features. Instead, Skywalker has a range of affordable trampolines with a bunch of premium features included. The Skywalker trampoline features a heavy duty rust-free galvanized steel frame. This translates into all-weather use. But you can prolong the lifespan of the trampoline by covering it during rain or snow or storing it inside. Also, this prevents wobbles. We have seen four to five kids bounce in it at one time and the trampoline didn’t budge an inch. Stays as steady as you’d like it to. If you are bothered about winds or if there is a likelihood of a hurricane, you can buy some stakes to secure it to the ground. Assembly and dismantling it is as easy as attaching a few screws. The only possible nit that we could pick is that due to the large footprint, it is shipped in multiple boxes and you’d appreciate an extra pair of hands while unboxing it and assembling the different parts. The overall design is very safe and secure. There are safety enclosure nets without gaps in them. There’s ample padding on the metal frame surrounding the bounce area. Most importantly, the bounce quality is second to none. It’s a very smooth and controlled bounce unlike some cheap trampolines which have a very wayward bounce that is difficult to control even for adults. In case a bounce does go off, the safety nets ensure that the kids bounce right back into the enclosure. Verdict: The Skywalker should be a unanimous choice if you are looking for a large-sized trampoline for three to four kids. 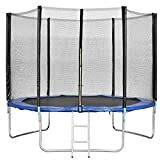 It also happens to be one of the top-rated trampolines on Amazon. If you don’t have that kind of space or are looking for something smaller, then read on. Still yet to find out, in the meantime…nothing. Once again, we have an excellent trampoline from Skywalker that includes a detachable basketball hoop. This one is a little smaller in size than the #1 pick in this list of best trampolines. This has a 10 feet bounce surface. But the highlight is the excellent construction, safety features and of course the basketball hoop that should keep kids occupied for hours. Have kids who are hooked on to technology? This is just what the doctor ordered. Dimensions: 10 ft x 10 ft.
At the forefront of their safety features is their patented no-gap enclosure system that creates a secure barrier devoid of potential injury traps. There are zero gaps between the safety nets and the jump surface which ensures that incidents like pinching or bruising of fingers and toes are avoided. Other than this, all the metal frames in the bounce area have sufficient padding to ensure that a landing gone wrong doesn’t hurt the kids. The frame itself is made from rust-resistant galvanized steel and each joint near the legs are welded. Additionally, 72 springs, each 5.5 inches in size and with a rust-resistant coating keeps the frame secure at all times. This prevents the structure from wobbling or twisting. No rust. So no structural weakening either. If you are concerned about outdoor storage, then there are protective covers available on Amazon for use during winter. Among all the trampolines sold by Skywalker, this one has the best bounce area. The bounce is springy and just perfect for a game of slam dunk. The basketball hoop attaches easily and firmly to two of the poles of the safety enclosure. There are four attachment points on the front and two straps on the rear to further secure it. The hook and loop design of the hoop allows children to play freely without worrying about injuring their arm or elbow. If the child applies excessive pressure on the rim, it automatically gives away and can be reattached in a jiffy. With a 3-year limited warranty, you cannot go wrong with this one. Verdict: This is a great trampoline at this price point. It is compact, has excellent bounce and is as secure as they come. If you are shopping for trampolines on a budget, then this one fits the bill. A couple of years ago, we had never heard of a trampoline brand called Zupapa. Skip to today, they are one of the best trampoline brands on the market. And for good reason at that. Their range of trampolines available in varying sizes are rated among the best for safety and they offer a bunch of accessories that are comparable to much higher priced models. In fact, we can successfully say that Zupapa offers the most complete trampoline sets that do not need you to make any additional purchases. There are stakes for grounding the frame, a rain cover, a heavier duty safety net and thicker steel frame than most of the competition. Dimensions: 10 Feet 5 Inches for the 12 foot model, 12 Feet 4 Inches for the 14 feet model and 13 Feet 3 Inches for the 15 feet model. Let’s talk about the steel frame first. A Galvanized, rust-resistant steel frame isn’t really a novelty feature. However, the frame used in the Zupapa trampolines are 42mm diameter X 1.5mm thick. This additional thickness comes at a cost though. It weighs from 164 lbs. for the smallest-sized model to 192 lbs. for the largest one. The additional weight ensures that even on a windy or breezy day, there’s zero risk of the structure moving or wobbling. To make things even better, Zupapa throws in 6 wind stakes (also made of galvanized steel) to secure the frame to the ground. The heavy duty springs that keep the structure upright are 7 inches each. Another first, Zupapa is one of the only brands that has 6-feet long safety nets that create an impermeable safety barrier around the bounce area. There are no gaps in the nets or near the joints where it attaches to the frame. The mesh net is UV resistant and has a strength rating of 110 grams per square meter. Most manufacturers offer a netting that’s rated for 75 grams per square meter instead. It’s not that the others are cutting corners. It’s just that Zupapa offers a lot more trampoline for a very affordable price tag. Even the maximum weight rating is a lot higher than other brands and as we mentioned earlier, the package also includes a rain cover. 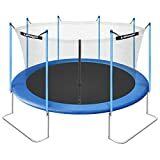 Verdict: This is one of the best trampoline for kids in this list. Period! There’s something about German engineered products that give them the edge when it comes to quality. Even seemingly ordinary features that are common across all the trampolines seem enhanced in the Ultega Jumper Trampoline. 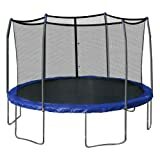 Coming all the way from Germany, this is a sturdy and safe trampoline with an entry-level price tag. It boasts of a decent weight rating and is available in an array of sizes catering to both, the space-constrained home owner as well as recreational clubs. Apart from the safety features, what caught our attention is the uniquely designed legs of the trampoline and the safety net. We have seen numerous trampolines with sturdy W-shaped legs that prevent wobble and provide stability. However, the Ultega takes it one notch ahead with outward-angled legs. Now, this might not seem like much of a difference. But it does prevent the structure from tipping over even if you have an overenthusiastic kid making frantic bounces trying their best to test the mettle of the trampoline. The frame is galvanized steel and rust resistant and there are 8 heavily-padded poles that secure the safety mesh net. Most other models have six poles. Also, we love the heavy padding around the frame in the bounce area. Everything from the frame to the springs are neatly tucked under a lush foam padding that keeps the kids secure. Sadly, the package doesn’t include a rain cover or any replacement parts. However, at the price point (under $200), it would be unfair to expect an all-inclusive package. The Ultega Jumper is available in five different sizes. The smallest is just 6 feet in diameter while the largest one is a generous 14 feet. So, irrespective of the size of your yard, there’s an Ultega Jumper for you. Last but not the least, the pricing is very competitive indeed. Verdict: With a great rating on most online retailers, a very reasonable price tag and some excellent features, you’d be hard pressed to not consider getting home the Ultega jumper. For a trampoline that’s designed so well, the use of straps and ropes to secure the protective mesh is a letdown. Not that it leaves any gaps in between the frame and the mesh, but at a time when even lower priced competition boasts of a patented no-gap mesh wall, this seems a little outdated. Let’s face it. At times, you just cannot resist going out and bouncing on a trampoline yourself with the kids. It’s fun. It’s relaxing and it burns hell of a lot of calories. The caveat though is that most of the trampolines in this list are designed for kids and do not support more than 200 lbs. The Exacme Trampoline on the other hand has a maximum weight rating of 375 lbs. making it the best trampoline for adults in this list. This is a TUV certified (more on this later), GST and UV tested trampoline. TUV SUD is an independent product testing organization that tests a whole range of products to meet international safety and quality standards. This certification indicates that the Exacme trampoline has been tested and vetoed for quality. Although, this is an independent certification, it is quite well received in the market and gives customers the much needed assurance about the quality of the product. Like all the others in this list of best trampolines, the Exacme stands strong on a foundation laid by 6-W shaped legs made of galvanized steel. Each of the legs have two contact points to improve stability and prevent wobbles. With a bounce area that is 3 feet above the ground, children sometimes find it difficult as they clamber on to enter the trampoline in excitement. This often leads to injuries or at times, can even tip the entire structure over due to the imbalance. Exacme adds a heavy duty metal ladder with slip-proof rungs that allows the kids to enter the trampoline easily. Also, the protective mesh has a zippered entrance which can be closed once the children enter the bounce area. Verdict: Despite a few niggles, the Exacme is a well-rounded package. With a bunch of certifications for safety and quality and an extended maximum weight rating, it is one of the few trampolines in this list that can be used by the entire family. The packaging is a tad poor. Also, we found that some of the poles had missing slots which had to be drilled into it. 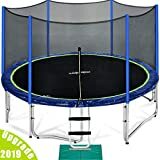 The next one is the first rectangular trampoline in this list and it comes from Skywalker, one of the best trampoline brands. For the uninitiated, a rectangular trampoline provides the best bounce quality among trampolines of different shapes. The reason is the perfectly positioned springs which allows the jumper better control over the take off and the landings. Whereas in a round one, the jumper is more likely to land in the center of the bounce area. Rectangular trampolines are preferred by those looking to hone their skills in gymnastics or competitive sports. Skywalker has designed the perfect rectangular trampoline with a heavier-gauge steel frame, an extremely roomy bounce area and a reasonably good maximum load capacity. We have already spoken at length about the safety features of Skywalker trampolines. 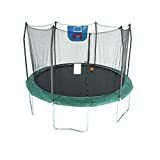 Like the Round and the Jump N’ Dunk trampolines, this one also has the patented no-gap net enclosure, the reinforced T-sockets and the heavy-duty springs which provide even tension. There is zero wobble or movement even when two to three kids are bouncing on the surface. By the way, the 15′ X 9′ bounce surface with even bounce throughout makes it an excellent choice for household with more kids than one. The kids can each get their own space to bounce without hindering each other. The only caveat is the slightly large footprint when assembled. The Skywalker Rectangular trampoline has a UV protected PE net mesh which is almost a pre-requisite these days during the hot summers. Another neat feature is the 1-inch thick foam padding around the spring pad. We have had two adults bouncing in the trampoline and there wasn’t even the slightest discomfort or bruising even when they landed on this frame. The protective net is 6 feet high and pretty much suffices for children. But due to the increased bounce that this offers, you might want to keep an eye on the kids as they bounce. Verdict: Most professional-grade trampolines are priced in excess of $1000. With a sub-$600 price tag, this rectangular one from Skywalker is one of the best trampolines that you can buy. Straight poles for the mesh. Having seen some swanky and some flashy looking trampolines so far, the Giantex Trampoline with its barebones design looks a tad obsolete. But unless you are looking for a design focal point for your yard, this is an excellent trampoline with a tall, protective enclosure. The design is a tried and tested one. Five U-shaped legs, straight padded poles, a padded mat and a weather-treated bounce surface. Nothing fancy about it. But it works just as well as you’d expect it to. To top it off, the smallest-sized model is priced well under $200 making it a budget-priced addition to this list of best trampolines. One of the advantages of having a simple design is that you spend less time setting it up. No drilling holes, no missing parts. The Giantex trampoline can easily be set up in minutes by even one person. It does ship in two boxes though. So, the inventory part may require an extra pair of hands. Unlike most other brands, Giantex gives you seven sizes to choose from. This allows you to pick the right-sized one for your home. Why, we have even installed the smallest one in the basement with taller-than-normal ceilings. Works perfectly! We love the 6-feet tall (70 inches) protective mesh. It’s not clear whether it is UV protected. Doesn’t say that anywhere on the packaging. But there are no gaps and the springs are neatly tucked away under a PE padding, which seems a little thin. We have seen trampolines with single-step ladders being peddled for much higher prices. The Giantex trampoline includes a full-sized ladder that makes entry into the trampoline effortless. A zipper seals the protective enclosure and even if children bounce off it, they will bounce right back into it. The frame is galvanized steel and rust-resistant. The manufacturers do recommend that you store it indoors during rains and extreme sunlight, which is a little strange. Although, we haven’t found the frame to be unstable or wobbly, we would have liked to see an extra U-shaped leg for this one. Maybe that’s just us. But most other trampolines in this list have at least 6 legs. Verdict: While not the best of choices, the multiple sizing options and the easy assembly make this a very good choice for recreational use in a backyard. It is priced competitively as well. We love all-inclusive packages as much as you do and our next pick in this list of best trampolines comes with everything you need to set up and use the trampoline for a long time to come. This is the ORCC oval trampoline that is available in two large sizes, 12 and 15 feet. Club the generous bounce area with the oval shape and the kids will have ample room to bounce about without elbowing each other. Also, ORCC is one of the only brands that use 7-inch springs. This gives it a slightly better bounce quality as compared to trampolines that use smaller springs. Also, we have spoken to customers who vouch for the quality of the frame more than anything else. A couple of these trampolines have survived hurricanes and falling trees without any major damage. Can’t ask for more, can you? The ORCC trampoline has a thick (1.5mm), rust-resistant galvanized steel frame that keeps it sturdy during use. It can withstand a fair amount of wind without being staked. But if you live in an area where strong winds are not uncommon, you’d appreciate the 6 ground stakes that are included in the package. These horseshoe-shaped stakes will further reinforce the trampoline in the ground. The bounce quality is top-notch thanks to the 108, 7-inch galvanized springs that are used for attaching the bounce surface to the poles and legs. No other brand uses as many springs as ORCC does. The highest number of springs that we have come across for a 15-feet trampoline is 96. Despite the bundled accessories and the excellent quality, ORCC keeps in the mid-level price bracket. The UV-protected polyethylene bounce surface offers an even and consistent bounce. There are minimal chances of rips or snags even after prolonged use. Also, this can be stored outdoors in summer or rain. There is a rain cover included in the package. Another neat feature is the 0.8-inch-thick PE+Pvc foam padding on the frame. While 0.8 inches isn’t the thickest pad that we have seen, this one offers excellent protection and feels lush to the touch. No complaints whatsoever! Almost forgot to mention that with a 330 lbs. 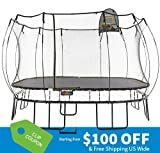 weight capacity, this might be one of the best trampoline for adults in this list. Verdict: With some amazing features and a well-rounded package, the ORCC trampoline is definitely one of the best trampoline to buy in this list. A list of the best trampolines would be incomplete without one from Springfree, wouldn’t it? Here’s the 13 feet Jumbo square trampoline from what is unarguably, the best trampoline brand in the world. Flawlessly designed, it does not have any hard edges, gaps or springs to worry about anywhere near the bounce area as it is elevated from the main metal frame. But that’s not all. There’s a whole laundry list of features that make this the best trampoline to buy. Weight limit: 220 lbs. per jumper. Total load of 1100 lbs. By now, you’d be so accustomed to hear us rant about galvanized steel frames that the double powder coated steel frames on the Springfree trampoline might sound like a refreshing change. It translates into all-year outside use and storage without worrying about rust or structural weakness. Both, the FlexiNet (teat-resistant and soft to touch) and the SoftEdge mat (30 times more absorption) in the trampoline are UV resistant and the bounce quality is phenomenal. Springfree is one of the first brands in the world to introduce outward curved poles (composite fiberglass) for the protective mesh enclosure. This ensures that your children or you for that matter, will never come into contact with the padded poles when you bounce. 8 U-shaped legs keep the trampoline fixed to the ground. Wobble, what’s that? Want to turn this into an interactive gaming system for the whole family? Buy the Tgoma accessory game system that is sold separately and the trampoline turns into a digital playground with a plethora of games and exercises integrated into it. Sensors built-in to the bounce mat tracks movement and it is updated in real time on a tablet that is attached as a screen on the protective mesh. You can track your bounce height, number of calories burnt and a lot more. If you do not want to spend as much, then there’s a detachable basketball hoop in the package for slam and dunk games. Verdict: If you are not penny-pinching, then by all means, go for the Springfree Jumbo square trampoline. 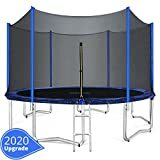 It is the best trampoline that money can buy and should provide you and your kids with unlimited fun and exercise for years to come. Safety net rated for up to 295 lbs. Tested for over 800 lbs. We’ve saved one of the best trampolines for the last. The coup-de-grace is the AlleyOOP double bounce trampoline. 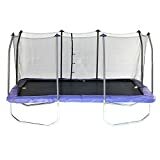 As is evident from the name, this one has two bounce surfaces with the lower one acting as a shock-absorbing system for 50% softer impacts as compared to normal bounce areas. The result is an incredibly smooth and safe bouncing surface that is perfect for both, recreational play as well as skill development. The AlleyOOP trampoline also has 50+ safety innovations & patents integrated into their design which gives you the much needed assurance about the safety of your children. The double bounce mats do a lot more than just absorbing the shock when multiple users are using the bounce area. It also creates a cushion of air under the main bounce surface that improves the bounce quality uniformly across the bounce area. Keeping the structure steady is a rust-free pre-galvanized steel frame that is 1.9″ in diameter, while 128 black springs offer an excellent rebound after the landing. The enclosure is protected by the overlapping doorway, another patented design that eliminates any gaps or chances of a fall out. Also, the net is rated to exceed impacts of up to 295 lbs. The heavily padded frame (foam covered with 21-ounce PVC outer covering) also doubles up as a rest area for kids when they are exhausted after a while. This is by far, one of the safest and most well thought out trampolines in this list so far. Jumpsport offers a lifetime warranty on all the steel and metal parts and a 5 year warranty on their Permatron bouncing surface which has a whopping, 10 rows of stitching. Even the pad covering the frame has a two-year warranty on it. With the industry-leading warranties, Jumpsport reassures you that in the rare advent of any damage, they have you covered! Verdict: If you seek a professional-grade bounce surface with almost zero chances of an injury, look no further. The AlleyOop Doublebounce trampoline with its 50 plus patented safety features is your best bet. True, it does cost a pretty penny. But it’s completely worth every dime that you spend on it. When we first decided to buy a trampoline, way back in 1997 for our six-year-old, we were overwhelmed with all the options in the market. Twenty years later, nothing’s changed. If anything, the online marketplace has further amplified the conundrum that we faced two decades ago. There are thousands of models from different brands in a variety of shapes and sizes to pick from. We have compiled this brief, but very effective trampoline buying guide that will show you what features to look for and what not to. This will help you to spot the potential pitfalls that are swept under the carpet during sales talk. This will also help you to make an informed decision rather than getting swayed by schmancy features that will be overkill at best. There are a bunch of questions, the answers to which will help you filter your choices. Who will be using the trampoline? Is it just for the kids or do you also intend to use it for exercise? How much space do you have in your yard? What are you willing to spend for it? 1. What are some of the important features to look for? Here are some of the most important variables to consider while shopping for the best trampolines. The frame: Most trampolines these days use galvanized steel frames which are pretty sturdy. Some brands though, like Zupapa and ORCC use heavier gauge steel for making their frames. Usually, the thicker the frames, the better it is. The caveat is that thicker steel frames tend to be heavier. Number of legs: The more, the merrier. Both W-Shaped and U-shaped ones work fine. But we prefer at least five legs on the trampoline. It helps improve the balance and prevents it from wobbling. Also, the legs should have a locking system to prevent the structure from twisting or collapsing during use. Safety Enclosure: It’s a given that you do not want to consider a trampoline without a safety enclosure around it. Most safety enclosures are made of UV resistant PE mesh and can withstand a fair amount of impact. The most important criteria here is how the net is attached to the safety poles and the bounce area. Look for trampolines that have a no-gap system that prevents the risk of limbs getting trapped in the gaps or even a fallout. 6-feet is considered to be the standard height for the safety net. Bounce surface: You need a UV treated bounce surface because it will bear the brunt of the activity and can be subject to extreme weather conditions. The best in this list is Springfree which uses the SoftEdge mat offering excellent bounce. Padding: Look for trampolines that use at least 0.5-1 inches of foam or PVC padding covering all the metal parts near the bounce surface. The padding must extend to the net poles used for the safety enclosure. 2. What are the different types of trampolines? Trampolines differ in their shape and the type of mat used for the bounce surface. Most of the trampolines in this list, barring the Skywalker Rectangle and the Springfree Jumbo, are recreational trampolines. If you are looking for trampolines for professional use, then check out some Olympic trampolines. 3. What are the different shapes of trampolines? Trampolines are typically round, square, oval or rectangular in shape. We touched briefly on some of the differences in the bounce quality earlier. Usually, rectangular trampolines are used for professional sport whereas the others are used recreationally. However, off late, there has been a slew of innovative shaped trampolines in the market, including an octagon shaped one. 4. What accessories should be included in the package? As long as there are no missing parts, you should be able to set up the trampoline pretty easily. However, given the extreme competition and the surging demand for home trampolines, most manufacturers these days throw in a few extras including rain covers, ground stakes and some even include replacement parts like springs. If you intend to store the trampoline outside permanently, then look for a package that includes a rain cover. Similarly, if you stay in an area with extreme weather conditions, look for ground stakes because trampolines are one of the commonest things you see flying around during hurricanes. Maintaining your trampoline isn’t half as difficult as it is often touted to be. Firstly, ensure that the setup is perfect. Screws should be tightened, springs fastened and it should be set up on a level surface. You might be tempted to move it under a tree due to the shade. But there shouldn’t be low-lying branches. Also, you will be spending a lot more time cleaning it during fall. Inspect it regularly for signs of wear and tear. Is the mat sagging? Are any of the frames bent? Are there any rips in the mat or the safety mesh? Have any of the stitches given away? Timely maintenance will help prevent the damage from escalating. Winterize your trampoline. Use a cover or store it indoors. If you intend to store it outdoors, remove the springs and store them in a cool and dry place. That’s it ladies and gentlemen! We hope you had a great time reading through our recommendations for the best trampolines. To sum things up once again, Skywalker’s Jump and Dunk and the Giantex are our picks for budget-minded shoppers whereas Exacme is the best trampoline for adults. If you have the space (and a tight wallet), there’s no better choice than the Springfree Jumbo. Also, the AleeyOop from Jumpsport is the safest choice. Happy shopping!